There are a handful of store bought condiments that are always in my pantry. No matter how easy it sounded when I read Make the Bread, Buy the Butter, I'm not making my own worcestershire sauce. I'm probably not even making my own mustard. There are always pickles, and sometimes they're things that I've just doused in vinegar and sugar and salt and other times they're store bought. 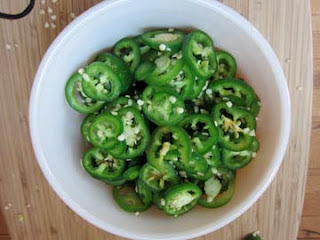 And there are always jalapeños, which are very easy to make yourself. We make a lot of tacos and burritos and nachos and such. It's pretty easy to throw together whatever veg and protein you have on hand, cover it in cheese and call it dinner. We typically add jalapeños to those meals. We make banh mi. * Jalapeños are important. 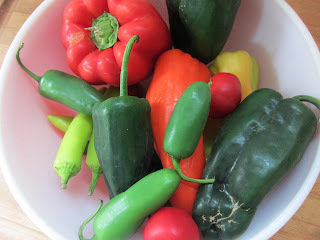 I had a big bowl of peppers, because my CSA announced it was pepper season and I asked my husband to buy all the peppers. Apparently, he was the rational one and he bought only one large bowl full. Good enough. 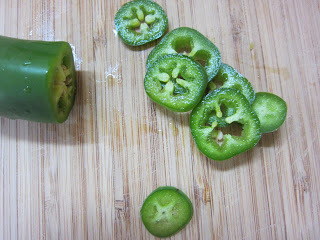 I sliced the jalapeños into standard nacho-style rings. I had 9 jalapeños, which was quite a bit, all sliced up. I sliced but did not photograph about six cloves of garlic. You can leave these whole, and while they won't flavor the peppers that much, they're delicious pickled and not "garlicky" at all. Anyway, toss the garlic in with the peppers. 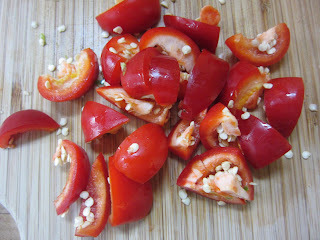 I also had three cherry peppers, which I chopped into narrow wedges. Jars with good lids for both, and then the brine. I started Googling the recipes, because I tend to eyeball mine, but since I'm telling you about it, I thought it was best to make sure I was doing it "right." The very first hit on Google is pretty close to what I do, it's just measured more precisely. Other recipes mix water and vinegar, some skip the turmeric, skip the garlic, add onions, so this is pretty flexible. 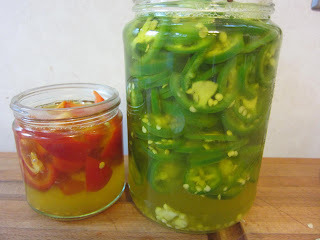 The only hard part is making sure that you have the right amount of brine for your peppers, and that's going to vary each time you make a batch. 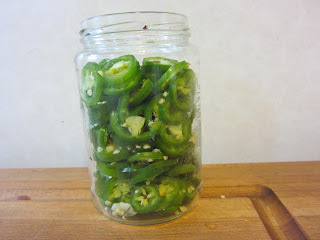 The brine trick --and I think I saw this attributed to Mark Bittman at some point, but I can't find a link-- is to put your jalapeños or whatever you're fridge-pickling into a jar, then fill the jar with liquid. Dump out the liquid and measure it, that's how much brine you need. What I do is significantly less elegant: make just about enough brine, and if it's not enough, add more vinegar. So the brine is vinegar, salt and turmeric. I tend to do about two cups white vinegar and a teaspoon each of salt and turmeric, and then yeah, if it's not enough, more vinegar. 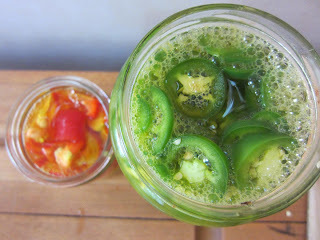 Bring your brine to a boil, then turn it off and pour it over your peppers. Let it cool until it feels like your jars won't explode in the fridge, seal it and fridge it. It's food, so you can eat it immediately, but you'd rather wait a day, and if you can handle it, a week. Here they are after four days. They're softer and more olive colored than on day one. 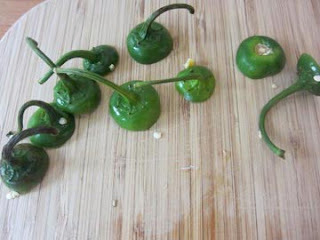 They're a little bit milder, in terms of pure jalapeño heat, but they have that vinegar perkiness that picks up on flavor and amplifies it, so they're milder but still have a lot going on. They'll mellow a bit more in time. 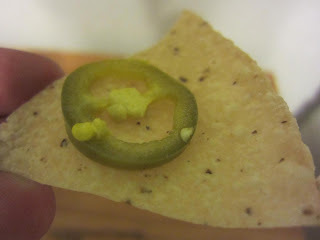 My husband tried one on the world's least innovative nacho (below) and was surprised at their heat, but that's going to vary pepper to pepper and based on how long they've been fridged. This is very vinegary and should keep for weeks, but if you notice it smells bad or looks fuzzy, it's no longer good. *About banh mi: Sure, they're easy to make, but a friend of mine brought me some pickled carrots and daikon from Fu Wah in West Philly, and now they're even easier. I had no idea they sold pre-pickled carrots and daikon, but that's the thing that keeps me from making banh mi every day, the pickling of the veg. They sell these little tubs and it's awesome, so if you're looking to make some banh mi, here's a shortcut. Boil the brine ingredients, turn off. 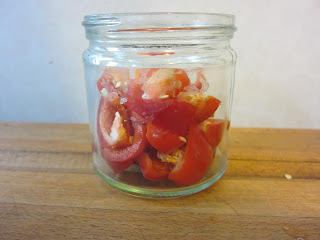 Slice the peppers and put in a jar with a good lid. 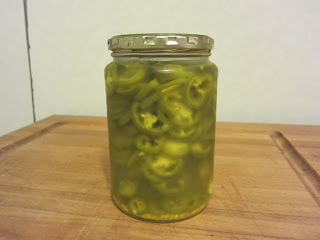 Cover peppers in brine, let cool a bit, seal and put in fridge. Better after 24 hours, even better after a week, keeps for several weeks.